(CNSNews.com) - In the first quarter of 2018, the number of Social Security beneficiaries topped 62,000,000 for the first time, according to data released by the Social Security Administration. 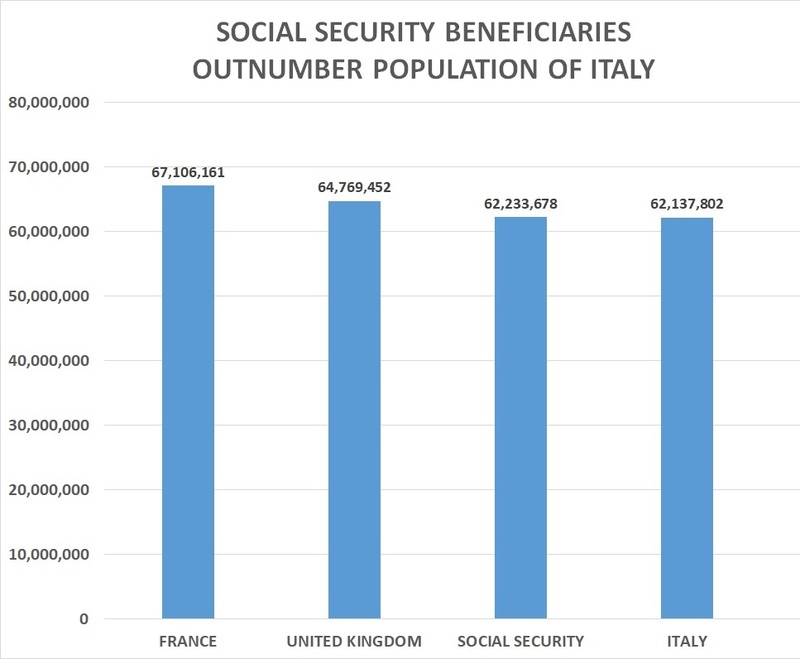 In fact, people receiving Social Security benefits in the United States now outnumber the population of Italy. Social Security ended the fourth quarter of 2017 with 61,903,360 beneficiaries. By the end of the first quarter of this year, that had risen to 62,233,678—an increase of 330,318 in three months. According to the CIA’s World Factbook, the population of Italy was 62,137,802 as of July 2017. That made Italy the 23rd most populous nation on Earth, ranking it after the United Kingdom, which was 22nd (64,769,452), and France, which was 21st (67,106,161). In March (the last month of the first quarter), according to the Bureau of Labor Statistics, there were 127,434,000 full-time workers in the United States. That means there were approximately 2.05 full-time workers in this country for every person receiving Social Security benefits. Total employment in the United States in March--including those only working part-time--was 155,178,000. 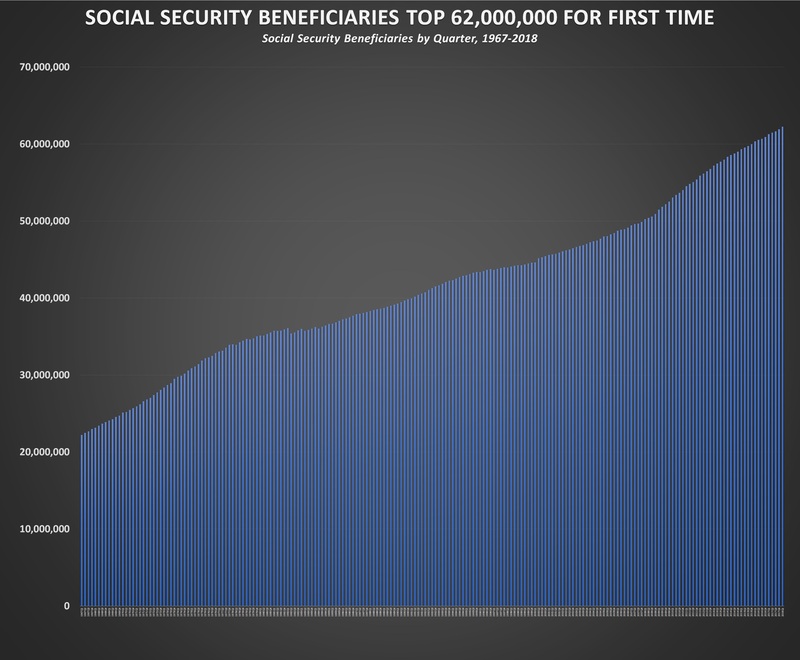 That amounted to 2.49 people with some type of job per person collecting Social Security benefits. The 62,233,678 Social Security beneficiaries at the end of the first quarter of this year included 45,876,131 retired workers and their dependents, 5,990,290 survivors of deceased workers, and 10,367,257 disabled workers and their dependents. The Social Security program includes Old Age and Survivors Insurance (OASI) and Disability Insurance (DI). These are supported respectively by payroll taxes of 10.03 percent and 2.37 percent applicable to the first $128,400 of a worker’s income. Self-employed individuals pay the entire combined 12.4 percent directly. Those employed by someone else split the tax with their employer. The maximum Social Security tax for a self-employed person in 2018 will be $15,921.60. But the Social Security taxes the government collects this year will not be enough to cover the benefits it pays out, according to the Social Security board of trustees. In the past, when the revenues from Social Security taxes exceeded the annual costs of the program, the federal government “borrowed” the money and spent it on other things. The Treasury now uses non-Social Security revenues to pay “interest” to the Social Security program for the money it previously “borrowed” and spent. Without this “interest,” according to the latest report from the Social Security trustees, the Social Security program has been in the red since 2010. “However, when interest income is excluded, Social Security’s cost is projected to exceed its non-interest income throughout the projection period, as it has since 2010,” said the trustees’ report.